The following are "embedded readings" which I call Cuentos Escalados. I really believe in this technique and offer 60 free Cuentos Escalados throughout these pages. Generally I project these stories to my classes right before taking a chapter quiz. It's a great way to review the vocabulary and structures with a new story. It also builds great inferencing skills as students try to figure out new vocabulary. 1-2 Picasso. Click to create your own Picasso! 1-3. Weird Al's version of the Brady Bunch. Keep watching! 1-4 Lee's bus ride to Coatzacoalcos (not really, but we'll say it is). 1-5. Inigo Montoya's famous line (warning: not for younger grades). 1-5. This pic shows most of the other characters. 1-5. Sorry about the grammar mistakes. I didn't create this myself! 1-6. If the dwarfs were mariachis! 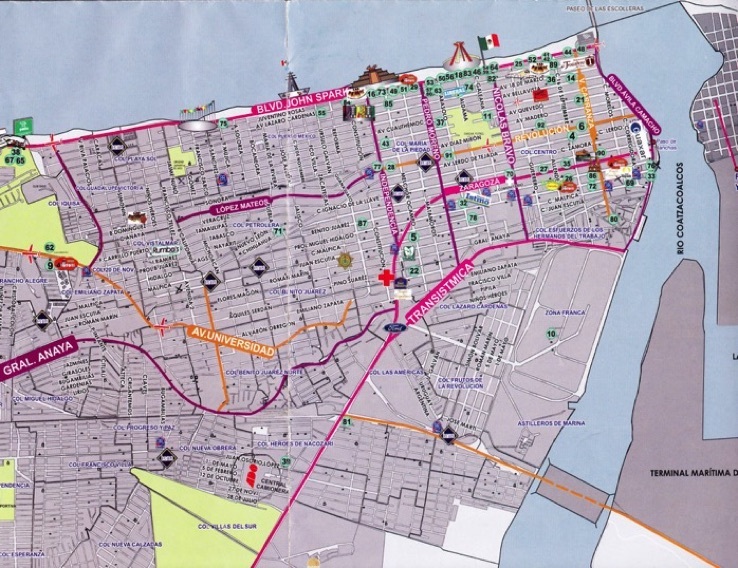 The map I used when visiting Coatzacoalcos. Pío Pista 1. Powerpoint to accompany the first episode: El agente doble.